We had friends over on Saturday February 25 2017. Oliver was a ball of energy, laughing and having fun. Day 1 – The next morning we woke up to a different boy. He was extremely irritable, more so than ever before, and we couldn’t console him when he became hysterical. We ended up taking a drive, which had always calmed him down, and even with that it took a good half hour for him to stop crying and fall asleep. That afternoon he felt warm and when we took his temperature he was at 103. We gave him some Motrin. Day 2- Monday he continued with a fever. I was not overly worried because he had run high fevers before and was prone to ear infections, so we continued with the Motrin. Day 3- Tuesday he still ran a 103+. As he napped on the couch, I noticed his little body shake slightly in his sleep. This wouldn’t be too alarming if he was well, but mom’s instinct told me bring him to the doctor right way. As we drove to the doctor, I looked in the rear view mirror and noticed the white of his eyes had become red. He hadn’t been crying. When we arrived to see his doctor, she looked concerned. She knew Oliver due to his repeat ear infections, and did not recognize the boy in his office. She tested for flu and strep, both of which were negative. She diagnosed him with an ear infection and put him on Augmentin. During the appointment, she asked about his red eyes and how long they had been like that. As I told her this happened on the car drive over, she mentioned the far-fetched possibility of Kawasaki Disease. 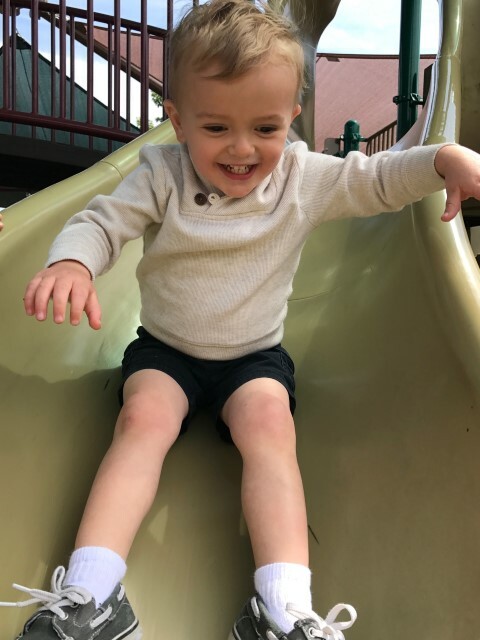 By her hesitation to mention it, and her words “I don’t want to scare you”, I knew that Kawasaki Disease wouldn’t be what we would want him to be diagnosed with. She didn’t feel it would be Kawasaki, but brought it up just as something to look into if we don’t see the fever go down with antibiotics. She told us to come see her the following day so she could evaluate his condition and determine if blood work would be needed. Of course, I went home and Goggled the heck out of Kawasaki Disease. I was up all night researching the disease. What I kept reading was: 10 day window to treat, aneurysms, #1 cause of acquired heart disease, misdiagnoses, etc. I didn’t sleep much that night. Day 4- Wednesday we returned to the doctor’s office, with Oliver still running a high fever with red eyes, but no new symptoms. She wrote us an order to have blood work done, but said we could hold off to do blood work until the following day, since we were only at day 4 of fever. We left her office and went straight to the lab. Day 5- Thursday morning I received a call from our doctor that there were some slight concerns with the blood work. There was nothing overly abnormal, but she wanted to look further into it. She told us to head to the ER at Rady’s Children’s Hospital and request to be seen by the Kawasaki specialist on call. She told us to come back the following day to continue to troubleshoot Oliver’s illness, if Kawasaki was ruled out. We ended up spending 5 hours at the ER in a hot stuffy room, only to have Oliver’s blood work taken and “lost”, and taken again. Oliver was an emotional mess and in so much pain. The specialist never spoke to us, but a nurse said the blood work showed improvement and we can go home. Tjey ruled out Kawasaki Disease. I was discouraged because here we had a very sick child, not responding to antibiotics, and I felt like there was something more going on than a virus. I pulled up the blood work from the previous day and analyzed it to the new blood work. I felt like his CRP and SED rate were still high, and although I am no doctor, something told me I needed to push harder. Day 6 – On Friday we returned to his doctor’s office. His regular pediatrician was not working, but she left instruction for another doctor. I asked lots of questions and wanted her to explain to us the “formula” for diagnosing Kawasaki. He only had a fever for 5 days, not “more than” 5 days yet, and only had one additional symptom at this time. This was did not meet the typical criteria for diagnosing. She decided to change his antibiotic to Cefdinir to see if he responded to that. She felt he probably had Adenovirus, and by day 6 would expect to see improvement. She also said she would follow up with the Kawasaki specialist – she was not 100% convinced that should be ruled out entirely, but was leaning towards a virus. We still didn’t have conclusive answers, and I was becoming fearful of the “what if” this is Kawasaki and we are losing time. I spoke with the doctor on call, as well as Oliver’s regular pediatrician later that day. We decided on a plan. If on Saturday (the next day), he was still is running a fever but has no additional symptoms, we hang in there until Sunday. If he develops any additional “Kawasaki” symptoms on Saturday, we admit him to the hospital. And if by Sunday, no additional symptoms but still running a fever, we admit him to the hospital. Day 7 – Saturday he still ran a 103+ fever. No other symptoms most of the day, but then I noticed his lips started to crack. I took a picture and emailed the doctor. Shortly after, Oliver started to moan when he walked. He cried with each step and said “mommy it hurts”, pointing to his knees. The doctor called about the cracked lip picture. I mentioned his knees, and she said, I am calling Rady’s Hospital, you need to admit him. We were admitted to Rady’s Children’s Hospital in San Diego on Saturday March 4th, 2017. He was given IVIG just after midnight on Sunday March 5th. After the 12-hour treatment, we went for his first Echocardiogram. The scan showed inflammation in his right coronary artery and his left anterior descending artery. We had to stay in the hospital for 36 long hours after the IVIG treatment, to be monitored and do a repeat scan. Our poor baby just wanted to go home, as did mom and dad. He didn’t understand what was going on, why we were in this strange place and why he was being poked and prodded constantly. He started to scream every time a nurse opened the door. We went for a second heart scan after the 36 hour period. The second scan showed slight improvement in his inflammation, which the doctors felt positive about. We were released on Wednesday, March 8th. Oliver would be on baby Aspirin for 6 weeks, and we would return for another Echocardiogram in 2 weeks. We also participated in a study for KD patients who had developed some level of heart damage due to the disease. Researchers believe Statins are beneficial in healing the cells of the coronary artery walls, and possibly help patients with heart damage. We were given Lipitor to take daily for 6 weeks. At his 2-week follow-up, blood work showed his Cholesterol level was too low, so at that point we had to take him off the Lipitor. During the heart scan, the Technician was eager to wrap up (I guess) and only got good photos of the left side. The right side weren’t good enough for our doctors to evaluate. The good news was the left side had shown tremendous improvement. The doctors felt that due to this improvement on his left side, it would be okay to wait until our 6-week scan to see the progress of the right side.